Dalston Dolls is based in Hackney where Mopsa has been making carefully crafted dolls for over five years. She has taught many doll making workshops. 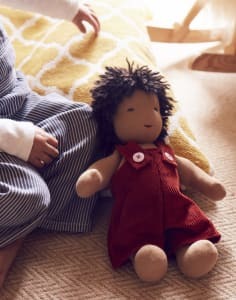 The dolls made at the workshops are traditional cloth dolls, often referred to as Waldorf dolls They are made from natural materials, with a simple expression for open ended play. I really enjoyed this course. Mopsa is very knowledgable and welcoming. I came away with a doll I am very happy with and new skills for future doll making! I attended a cloth dollmaking course held by Mopsa Wolff at her welcoming home in Dalston. The course was well organised and each stage was clearly explained which resulted in taking home a beautiful finished doll, ready to dress, at the end. Mopsa is a very patient, informative and friendly teacher and her creative talent shines in the beautiful character dolls she creates. I can highly recommend taking a course with her.